All participants in Fun in French will have French class taught by a qualified teacher. 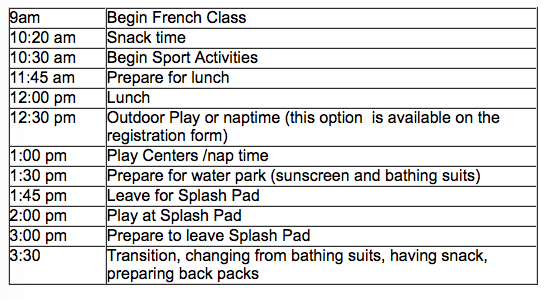 Children who are 4 and 5 years of age will have a French class for 45 minutes a day as well as arts and crafts in French for an additional 45 minutes, and children between the ages of 6 to 9, will have French class for 90 minutes per day. The camp is still a bilingual one as all counsellors are bilingual. However, to encourage our campers to communicate in French, the counsellors will speak in French first and if needed they will use gestures to help the children understand. Parents whose children are in the 4 and 5 year old group will have the option of having their child have a nap after lunch. This option is on the application form.